1. 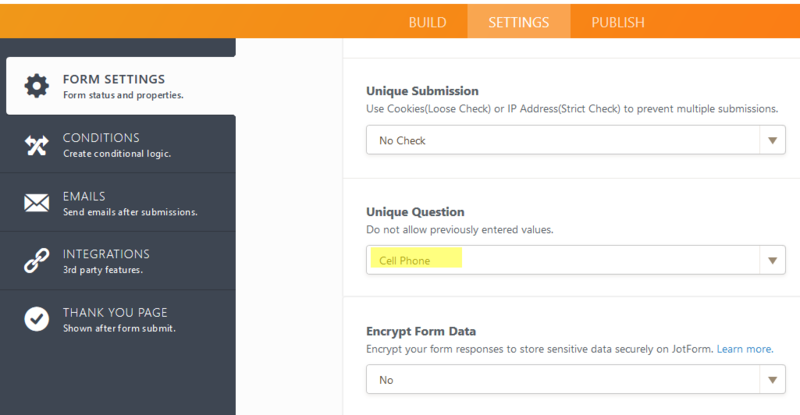 Add a Short Text Entry field (rather than the pre-designed phone field) and label it as Cell Phone. 2. 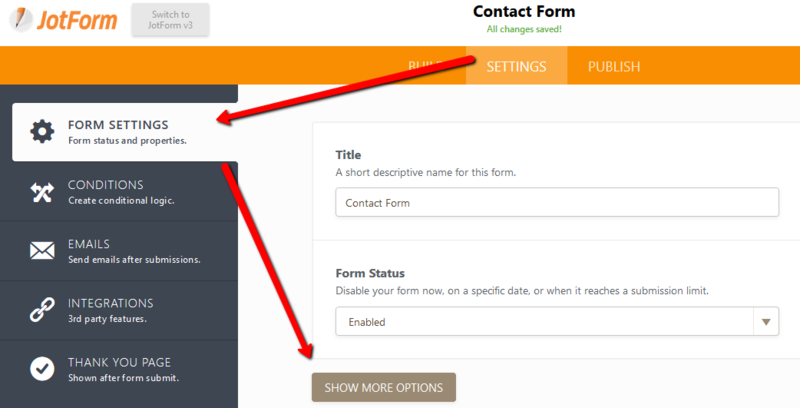 Click on Settings>>Form Settings, and then on the Show More Options button. You can even customize the Warning message. You can find out more details on regards to Form Warnings. 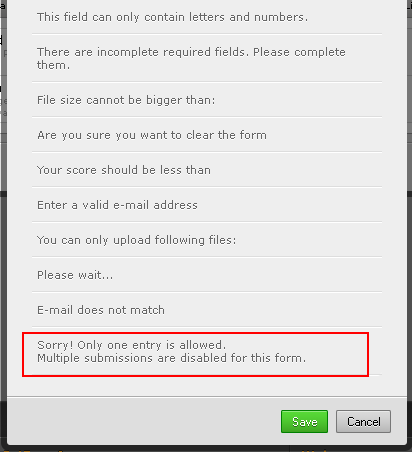 Form limits based on Unique Questions will work on any input type such as Email fields or plain Text fields. On the example above, you can even add a Hover Text and a Hint value to indicate if you want only numbers or just separated by a dash, as on this example. 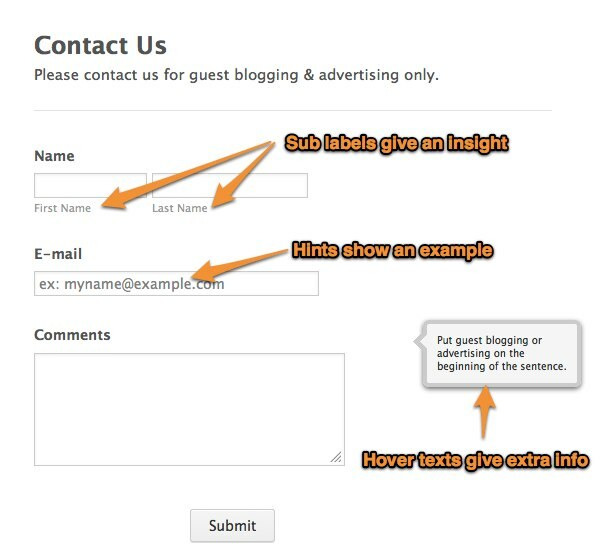 Currently, this feature is available only for drop down selectors and fields which have a single text box. It will not work for Full Name, Phone or (Postal) Address because they each consist of multiple text boxes. It also will not work for Text Areas (the tool immediately under the Text Box in the Form Tools menu). We would like to limit the number of submission to 1 per day per email address. It would be great if we could setup a unique value based on multiple fields: email address and a hidden field with today's date in it. We made Ticket Code a unique field and it's not working. It allows the form to be submitted again with the same ticket code. What are we doing wrong? The TicketCode is a simple text box that consist of one letter and three numbers (no other character, space, etc.). how do you limit to one unique question per day? I've set up a Single Name Field and Date Field which i combine in a calculation widget that I would like to use for a unique field will that work? This is a GREAT feature! But, you need to get it working for Full Name, Phone Number and (Postal) Addresses so that people can validate submissions.!! If I have a submission that needs to be edited and I have a unique question, an edited submission will still be allowed correct? We have a booking form with times but teachers would like to block out some of the times en masse. Rather than them putting a lot of dummy records in, I tried uploading the required records using the Import CSV. However when I try to add an entry using one of the blocked out times it still allows me. How do I convince the system that these times are already booked? We would like this to work in Quick Tools "Number" field because we want to also use the minimum and maximum value. But it appears the Unique Question doesn't work with the Number field. Can you make it work with that? We need the flexibility both offer. Hi. Have you removed the feature "Unique Question"? otamabil sitesine ilan formu eklemek istiyorum.yalniz ilan verildiyi zaman siteme gelmiyor ilan. bunu nasil ayarlamaliyim.lutfen cevaplandirin sabirsizlikla bekliyorum. Is there a field limit on the application form if we use your free app? Are deactivated forms reactivated when a new month starts if a person chooses not to upgrade?